I just love Kokum Butter. It has a very hard texture, but melts when it touches the skin, and has a wonderful natural fragrance. It is obtained from the Indian tree Garcinia indica. But, none of that really matters unless it provides some benefit. While Kokum Butter is not as diverse as the some of the other butters, it holds its own in the healing department. Since it absorbs quickly into the skin without clogging pores, it is exceptionally beneficial for carrying the healing properties of creams and salves beneath the skin. It is known to be incredibly beneficial for helping regenerate tired, worn skin cells, as well as adding flexibility to the skin cell walls because it is rich in essential fatty acids and Vitamin E.
It’s not all about the healing ingredients, though. Kokum butter adds a smooth creamy texture to many balms and salves. Because of it’s hardness, there is less need for beeswax, too. I use this in my ChocoMint lip balm and you wouldn’t believe the texture it provides! It lends a velvety feel to my lips and instantly adds softness and soothes dryness! If you are allergic to nuts, it is not recommended that you use Kokum Butter. It is possible that you will have a reaction to this butter. Everyone has heard of Cocoa Butter. What pregnant woman hasn’t been handed the advice, “rub cocoa butter on your belly and you won’t get stretch marks’? Got dry skin? Half the commercial lotions on the market contain this butter. Lips rough and dry? Check out the ingredients on most of the natural lip balms and you’ll find cocoa butter. But, why, and does it really work? The simple answer is, yes, in my experience, it works wonderfully. But only when combined with other healing ingredients. Cocoa Butter is extracted from the cacao beans, the same ones that give you chocolate and cocoa powder. It smells mildly chocolate-y and is very hard when it is unrefined. The refining process removes the scent, as well as many of it’s healing properties. It is edible, also, but I wouldn’t recommend biting off a hunk unless you were really hungry! It has natural preservative properties that make it incredibly stable and gives it a very long shelf life. Plus, it has a low melting point, so it, like many other butters, turns to liquid on contact with the skin and sinks below the surface, carrying it’s healing properties with it. That makes it perfect for soothing skin conditions that involve dryness, itchiness or any other irritations. It is reported to help the skin hold in moisture and contains many natural antioxidants, as well as Vitamin E and has natural antiseptic properties. It is often used in massage therapy because it is reported to help ease tense, sore muscles. Soapmakers often find it beneficial to add to their products because of its ability to lather, as well as for it’s many skin-healing properties. A quick peek at my products ingredient lists will tell you how much I believe in these four butters. There are many other butters available and I look forward to learning about them, playing with them and sharing my experiences with you, but these four will always remain foundations in my skin and hair products. Want to try out the benefits of these butters for yourself? Check out my shop, Tamara’s Herbes, where you’ll find products to fit your every need. You will never find chemicals, fillers or synthetic preservatives. My entire line of products is available as samples. If you don’t see it listed, ask me! I love coming up with new formulas and products! AKA: Karite butter. This soft, thick butter comes from the fruit of the Shea Nut tree which grows wild throughout much of Central Africa. Please note that the following information is only accurate when using natural, unrefined Shea butter. Processed or refined Shea butter loses most of its beneficial properties. This butter is a saturated fat that is packed full of vitamins A & E, as well as allantoin and catechins. This is really just a fancy way of saying this; Shea butter contains compounds that are known to be antioxidant, moisturizing, nourishing, healing and soothing. Vitamins A & E are believed to help with the appearance of fine line and wrinkles. Shea butter is reported to be a natural moisturizer and emollient, as well as a competent cell regenerator. It is known to pull moisture from the air, which results in your skin maintaining that extra moisture throughout the day. This also provides your skin with added elasticity, which leads to younger-looking skin, as well as reducing the appearance of stretch marks, scars and other skin blemishes. Shea butter is a natural anti-inflammatory, too, which makes it beneficial in cases of arthritis, rheumatism, and sore muscles. Then, to round out this incredible natural product, it also has a natural SPF of up to 6! The problem with some natural butters is that, while they work wonders on your skin, they often leave behind an oily residue that can leave you feeling heavy and greasy. Not so with Shea butter. This butter soaks into the skin quickly, carrying with it all of it’s benefits. Shea butter is great for more than just skincare, though. It is also wonderful for restoring moisture, vitality and strength to dry, brittle, damaged hair. One word of caution when using Shea Butter: It produces a natural latex. If you are allergic to latex, this is not the ingredient for you! It is more difficult to find reliable information concerning mango butter. However, years of searching, experimenting and digging for obscure bits of folklore, I’ve come up with the following information. Mango butter is a natural emollient that is fantastic for softening, soothing, moisturizing and protecting the skin. It is reported to help with cell regeneration and wound healing, as well as helping to reduce fine lines, wrinkles and other signs of aging. I’ve found this butter to be especially beneficial in treating ultra-dry skin, skin rashes and eczema and I often use it as one of the base ingredients for healing salves. It is rich in beta-carotenes, as well as vitamins A & E and essential fatty acids. 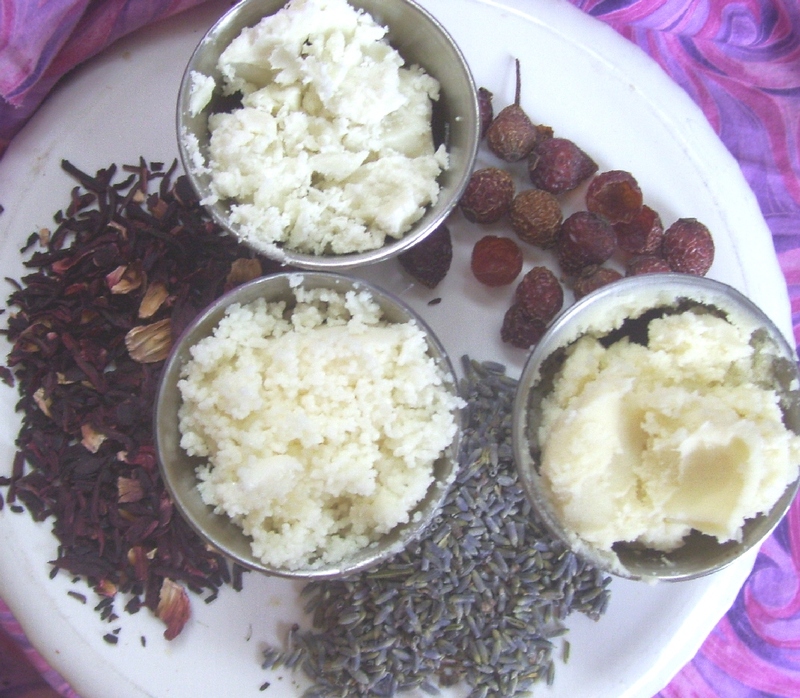 While Mango butter provides many of the same benefits as Shea, Cocoa and Kokum, I’ve found that the blending of these butters produces a far more powerful effect than using them alone. Both Mango and Shea butter are often found in high-end spa products around the world. There is a ton of information floating around out here in Cyberland about natural ingredients and their benefits, I know. So, why bother adding one more site to the hundreds out there? Because I feel like it is truly important for the public to understand the many benefits of the ingredients that nature has provided. There are so many ingredients….herbs, butters, oils, flowers, clays… the list goes on forever. So, how do you choose which one would be best for you? The truth is, no single ingredient, natural or not, is going to give you instant results for anything that might be ailing you. There is no ‘magic pill’. However, that doesn’t mean you should give up hope just yet. The true beauty of natural ingredients is that, when blended, they accent and enhance one another. That is why you will find such a variety of ingredients in many of my products. Over the next few weeks I’m going to be posting a series of articles in my blog that describe many of the ingredients used in my product in detail. Their history, their uses, their warnings…information that will make it easier for you, the user, to decide what would work best for you. Just to make things interesting, I’ll even be throwing in a recipe here and there to help you create your own natural beauty recipes. If you have any questions, please feel free to e-mail me. If you know of something I’ve left out, please don’t hesitate to fill me in. I’m not, after all, the final word on any of these ingredients and I’m always open for learning something new! Please remember, too, that I am not a medical doctor. I’ve never had formal medical training. I can’t diagnose your ailments or cure your disease. I can only offer you information that has been passed down for centuries. Most of the statements you will find are not backed by the FDA, the CIA, the FBI, or the KGB…in fact, no government agencies at all are willing to say that any of them even work at all, but that’s a whole nother story…! I hope you enjoy this series and find something to take away with you that makes a difference.